Good morning to my crafty WOYWW friends! 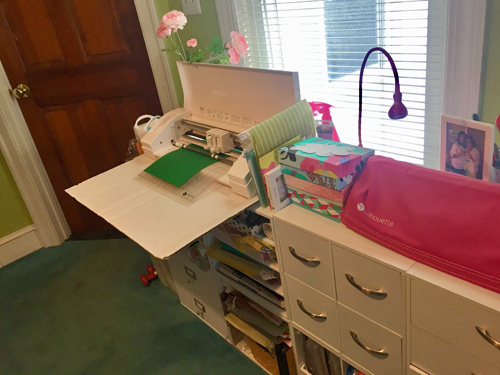 For those of you that aren’t familiar with WOYWW (What’s On Your Workdesk Wednesday), head on over to Julia’s Stamping Ground and you will find desks from all around the world where we get to snoop on other crafter’s desks. Well hello there! It’s so sunny here right now that it is making me happy. 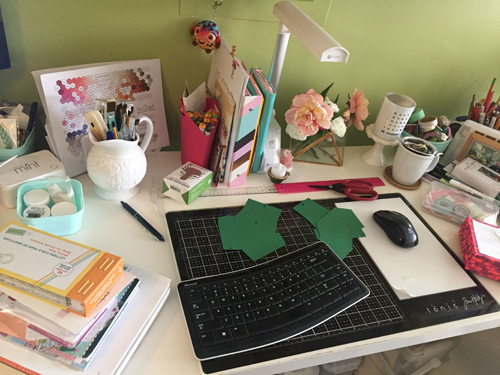 It made taking a photo this morning of my somewhat clean desk a joy. On the right you can see the box ready to go with the custom card order I had been working on for the last few weeks. I am going to mail them off to my client today. Above that box is a container with all my bits I use in my dot journals. You can see some cute Starry lights I found in the dollar spot at target. Not sure what I will do with them yet. Of course, there is a teacup on my desk. Tea is my beverage of choice pretty much all year but especially in the winter. I am trying out a car diffuser for the first time. This year my husband bought me a diffusor and some lovely essential oils and I use it in my craft room. So I can use the same oils in the car. I am thinking of getting a pine scent to keep me in the holiday spirit. Oh, and yes, it’s on right now — Christmas music. 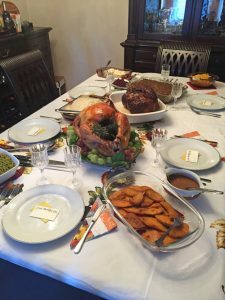 I waited until our Thanksgiving holiday ended and then I rushed to put on Holiday music. Right now ‘Santa Baby’ is playing while I type. The green cardstock is two segments for a 3D Christmas tree advent calendar I am cutting out on my Silhouette. As I begin to prepare holiday decor for my home, I also supplement it with themed paper crafts. On the left are Copics, paint brushes, embossing powders and a pile of books and odds and ends. But let’s just rejoice in being able to see some of my actual desktop. haha!! 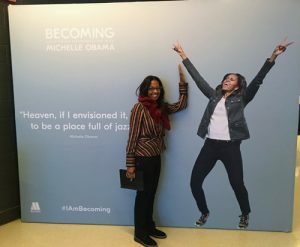 We had a lovely Thanksgiving with my in-laws and on Saturday, my husband took me to see the incredible Former First Lady Michelle speak. 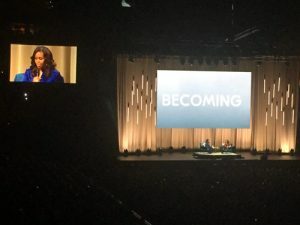 I had pre-ordered her memoir and found out she was coming here to speak so he bought tickets. It was such an inspirational talk that I will never forget. I miss our former president and first lady so much. Well, I have to hustle. I am dismissing the boys early for flu shots and I need to wrap up a few things. Have a blessed day my friends.